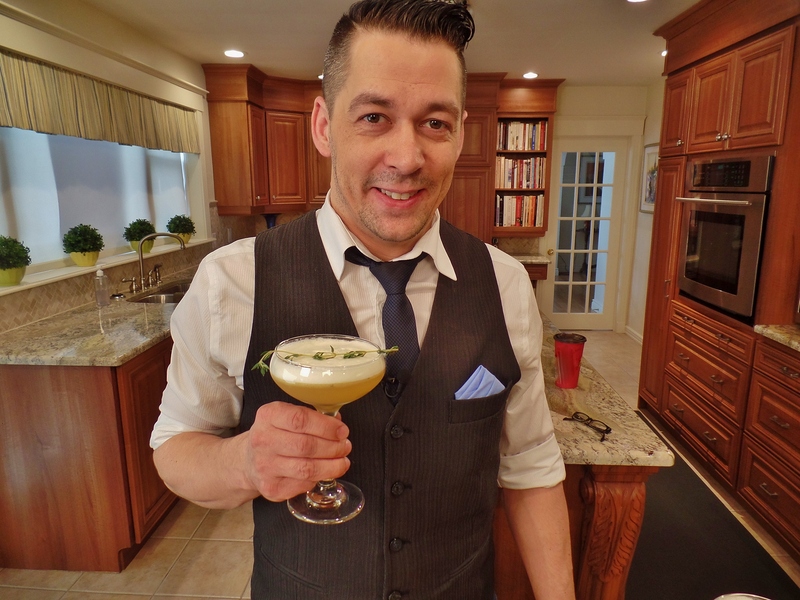 Sheldon O’Neill has a finely tuned palate that allows him to design the most nectarous cocktails. He would probably describe his avocation by saying he’s a mixologist. With respect, I do not agree with “mixologist” as an accurate descriptor for O’Neill. According to Merriam-Webster, mixology is “the art or skill of preparing mixed drinks”. O’Neill does much more than that. Several years ago I heard BC restaurateur Rod Butters describe his bar staff as “liquid chefs”. I favour the term because at RauDZ (Butters’ Kelowna restaurant) every drink recipe was created, tested and refined in-house, utilizing ingredients from all food groups, as well as alcoholic and non-alcoholic liquids. RauDZ liquid chefs employed the same process as that of the restaurant’s savoury and pastry chefs when they created recipes. O’Neill made one of his cocktails for me this week. It was called Sailor’s Thyme. He created it for the St. John’s Fish Exchange. It was a combination of gin, citrus, fresh thyme, egg white and Third Place Tonic. Given the cocktail’s various tastes and scents from flora and woodlands (juniper rich gin, fresh thyme, lavender and hint of greenery in the tonic) it was like imbibing the viridity of a sun kissed forest glade. 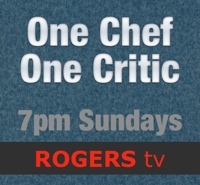 Sheldon O’Neill was at the house this week because until sometime in May our house is being used as the set for the Rogers TV show, One Chef One Critic. He, along with 13 other chefs, stopped by to demonstrate how to make a wide variety of temptations. It was also an opportunity to catch up on what’s been happening lately in the busy lives of some of the leading lights on the local dining scene. Evan Bursey, for example, has recently signed a lease to operate a new gastropub at the old Bistro Sofia location on Water Street. It will be called the Fort Amherst Pub and should open within weeks. Planning is well underway, with the goal of creating menu items that will rock, and for a reasonable price. He demonstrated a Fort Amherst Pub dish for us. 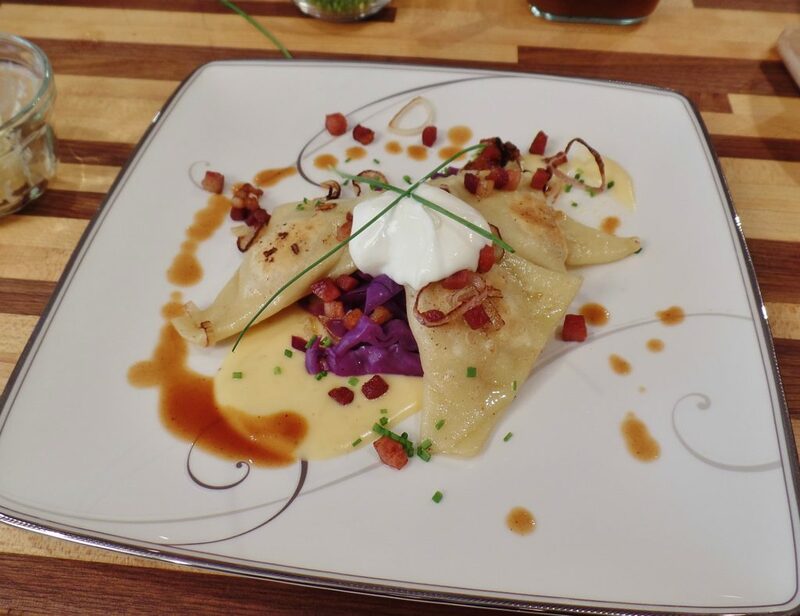 It was an attractive plate of sautéed pierogis. The Eastern European inspired parcels were like wrapped gifts, revealed only after being bitten into and savoured by thousands of taste receptors on the tongue. Succulent braised pork they were, decorated and thoughtfully accented by yin and yang sauces, red cabbage, bacon, sour cream and frying companions, butter and shallot. Brenda Lee, who for the past several years cooked at Portobello’s, is now chef at the Pantry, a social enterprise restaurant at the Elaine Dobbin Centre for Autism. Lee told me the new gig has been a joyful experience and good for her creatively. She looks forward to working with the fresh ingredients that will be grown this summer in the centre’s garden. Her roasted rhubarb slaw was made from rhubarb harvested from the centre’s garden. Actually, it was roasted rhubarb purée that gave the slaw its delicious fruitlike background. The perky mixture of purée, grainy Dijon and apple cider vinegar was stirred through crunchy julienne carrot, celery and cabbage. Then it was only for Brenda Lee to add fried triangles of feta (the prize of the plate) to complete this hot and cool appetizer. Slightly mottled cream in a wide white bowl looked as though its calm had suddenly been interrupted by a burst of colour from below. 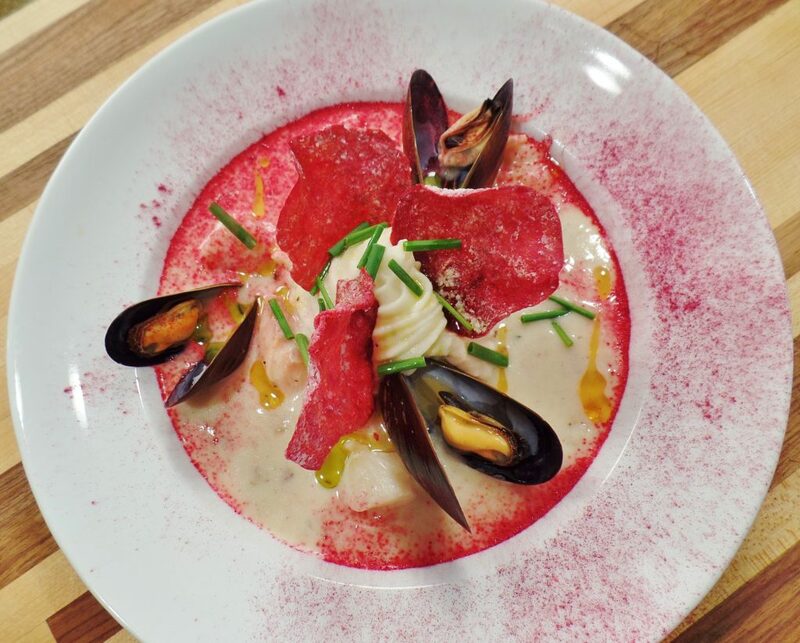 Shiny dairy based fish chowder had become background for a breaching centrepiece of swirled cream potato attached with bright red fins of baked beetroot chips. Still more colour broke the monocoloured background. Three orange mussels on the shell, chopped chive and, finally, a fine dusting of beetroot powder. 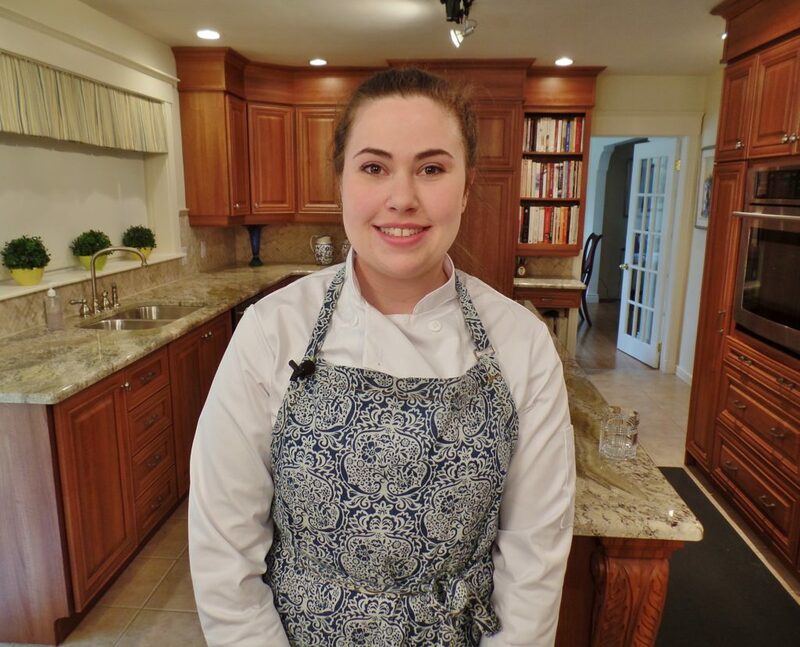 It was the work of veteran chef and culinary instructor, Bob Arniel, whose Chef to Go catering business and school has become a magnet for home cooks wanting to improve their cooking skills. Arniel had put together fish stock, cream, butter, cod, salmon, shellfish and dash of sherry to create a beautiful, warming dish. The decoration was classic Arniel, who is also known to be an ace food stylist. Finally, Brenda O’Reilly of Yellow Belly Brewery and O’Reilly’s Irish Pub told me that the latest addition to her group of gastropubs, Mussels on the Corner, will be opening for regular customers in a matter of weeks. O’Reilly pleasantly surprised us by making something that’s most likely never been made before, but that should be an automatic hit with Newfoundlanders and Labradoreans. It was, wait for it, seal flipper poutine. 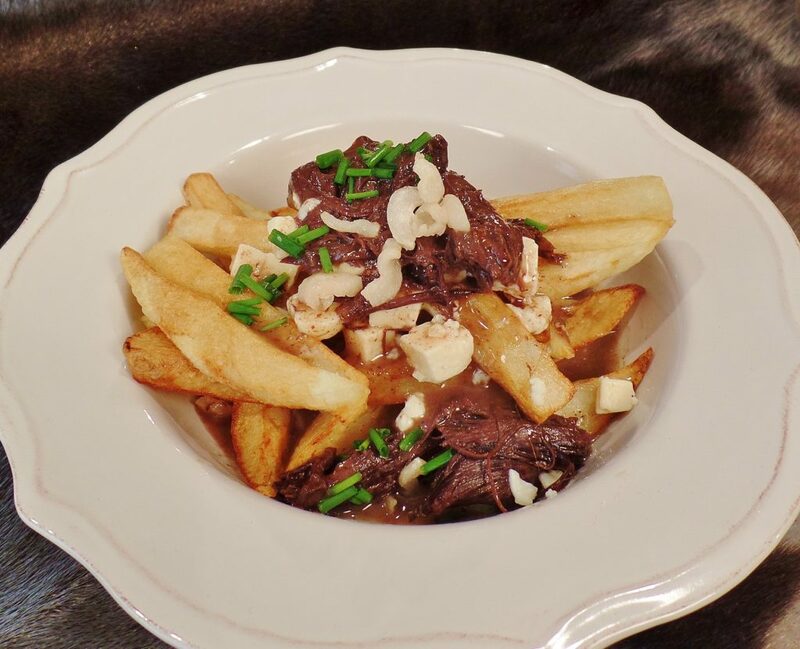 Hot homemade chips (fried in a home chip fryer no less) were placed in a bowl, salted and vinegared and then covered with roasted seal meat, cheese curds infused with Fighting Irish Red Ale for that je ne sais quoi touch, rich gravy and scrunchions. One bite and any seal flipper fan would have thought they’d died and gone to heaven. I did.